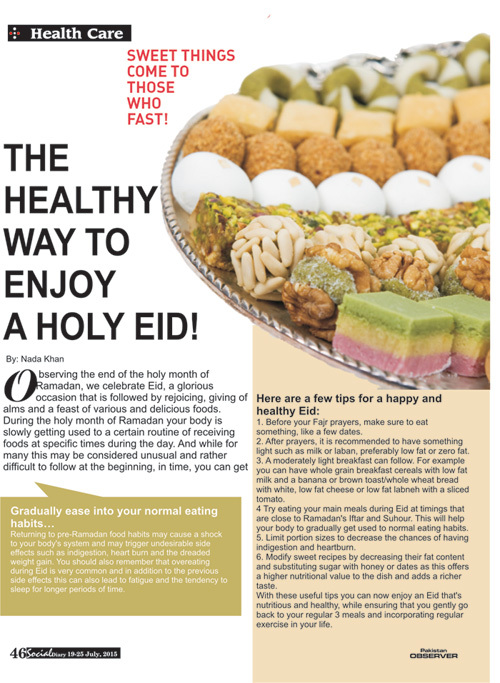 Home Health Care The Healthy Way To Enjoy a Holy Eid! Observing the end of the holy month of Ramadan, we celebrate Eid, a glorious occasion that is followed by rejoicing, giving of alms and a feast of various and delicious foods. During the holy month of Ramadan your body is slowly getting used to a certain routine of receiving foods at specific times during the day. And while for many this may be considered unusual and rather difficult to follow at the beginning, in time, you can get used to it and enjoy it. Returning to pre-Ramadan food habits may cause a shock to your body’s system and may trigger undesirable side effects such as indigestion, heart burn and the dreaded weight gain. You should also remember that overeating during Eid is very common and in addition to the previous side effects this can also lead to fatigue and the tendency to sleep for longer periods of time. 1. Before your Fajr prayers, make sure to eat something, like a few dates. 2. 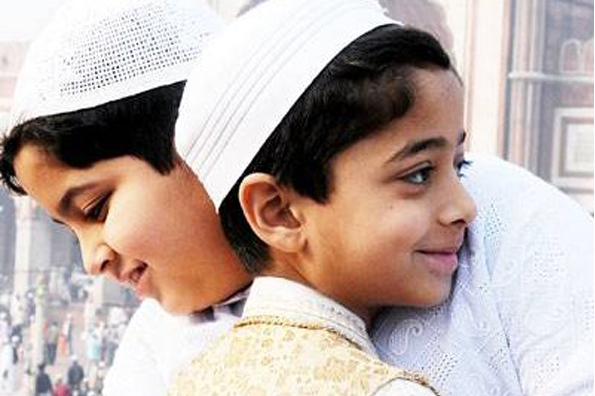 After prayers, it is recommended to have something light such as milk or laban, preferably low fat or zero fat. 3. A moderately light breakfast can follow. For example you can have whole grain breakfast cereals with low fat milk and a banana or brown toast/whole wheat bread with white, low fat cheese or low fat labneh with a sliced tomato. 4. Try eating your main meals during Eid at timings that are close to Ramadan’s Iftar and Suhour. This will help your body to gradually get used to normal eating habits. 5. Limit portion sizes to decrease the chances of having indigestion and heartburn. 6. Modify sweet recipes by decreasing their fat content and substituting sugar with honey or dates as this offers a higher nutritional value to the dish and adds a richer taste. Previous PostSehr Wearing Farida Hasan Eid luxe formals Next PostThe Whole Month Of Ramazan Was Filled By Game-Shows!